John Hannah, Emeritus Professor of University of Otago, Director of Vision NZ Ltd.
1) This paper was presented in a plenary session at the Pacific Region Small Island Developing States Symposium, 18-20 September 2013 in Suva, Fiji. The paper discuss how surveyors can contribution to the issues of climate change and responsible governance, particularly as they affect Small Island Developing States (SIDS). The paper reflects some of the work the FIG Task Force on Climate Change has been undertaking since it was established in 2010. John Hannah is chair and at the FIG Congress 2014 in Kuala Lumpur, Malaysia the task force will deliver a final report. Small Island Developing States (SIDS) face much higher vulnerabilities than developed nations. A substantial number of these vulnerabilities are linked to climate change and involve decisions over the future best use of land and other resources. The surveyor has a diverse skill set that can be used to provide the data, the analyses, the insights and the understanding needed to help make these decisions. This paper then, which reflects some of the work of the FIG Task Force on Climate Change, discusses the contribution that surveyors can make to the issues of climate change and responsible governance, particularly as they affect SIDS. It begins by outlining the role that the surveyor can play in climate change and land governance studies and then discusses the important issues being faced by SIDS. It then draws all these threads together, making some firm suggestions as to how surveyors can help SIDS as they grapple with future change. It concludes by noting that while in recent decades it has perhaps been the profession’s lack of public profile that has limited the call for such contributions, this need not be the case in the future. to conduct research into the above practices and to develop them” (FIG, 2004). While these are very broad statements of capability, they give rise to a practical, pragmatic professional person who understands spatial measurement, who can represent and interpret spatial information, who is very competent in the administration and governance of rights to the land and sea, and who is capable of planning for the development and use of land. Such a person typically has much of the technical understanding and many of the skills necessary to exercise responsible governance over land, being willing to innovate and reform where necessary. The breadth of professional knowledge and experience in these issues that surveyors have is an invaluable resource to a world seeking long-term sustainable solutions to its many and varied land administration problems. In addition to finding solutions to these land administration problems, the surveyor’s expertise in spatial measurement and analysis allows reliable measurements to be made in monitoring some of the direct impacts of climate change. For example, it is the surveyor who measures sea level rise, then links these measurements to a local reference frame. The surveyor then further links these to a global reference framework. It is only in such a framework that the true global impacts of climate change can be understood. Additionally, it is the surveyor who is able to take a wide variety of measurement data, transform it into a common reference system and then integrate it into a Geographic Information System (GIS). The GIS then becomes a powerful tool for assessing the likely impacts of climate change on communities (large or small) thus supporting the development of the mitigation policies needed to protect those communities. This paper then, which reflects some of the recent work of the FIG Task Force on Climate Change as well as earlier work done in 2010 (see FIG, 2010), discusses the contribution that surveyors can make to the issues of climate change and responsible governance, particularly as they affect Small Island Developing States (SIDS). It begins by outlining the role that the surveyor can play in climate change and land governance studies and then discusses the important issues being faced by SIDS. Finally, it draws all these threads together, making firm recommendations as to how surveyors can help SIDS as they grapple with future change. The evidence for present day, human induced climate change is overwhelming. However, the full extent to which climate is likely to change in the future (both near term and long term) remains unclear. Climate models produce a wide range of possible outcomes depending upon the various forcing factors used – factors that, in turn, depend upon assumptions relating to industrial growth, greenhouse gas emissions, deforestation, and human response (amongst other things). Coping with the resulting environmental change (the 20th ranked issue in UNEP, 2012) requires the assessment of a wide variety of response options. In the same vein, other UN documents (e.g., FAO, 2012) encourage states to have laws, policies, strategies and actions that are designed to protect the legitimate tenure rights of those affected by climate change. Such states are encouraged to prepare and implement strategies and actions to help those displaced by the impacts of climate change. Similar (but wider) provisions are suggested for dealing with the effects of natural disasters. The question may be asked, ”Where do surveyors fit into this picture?” What particular knowledge does the surveyor have that can assist the global community as it grapples with its understanding of the quantum of change and, with it, the various mitigation or adaptation strategies that may be required? The paragraphs below seek to answer these questions. The surveyor, by virtue of his/her spatial measurement skills, is closely involved in monitoring spatial change. Typically, such change is determined with respect to some coordinate (or reference) system – a system most likely established by professional surveyors. It was surveyors, for example, who were responsible for the definition of the current Fiji Geodetic Datum (1986) [c.f., Hannah and Maseyk, (1989)]. As with any reference system, its long term stability (or alternatively, an accurate knowledge of movement in that system with respect to time), is crucial if the data provided by global monitoring systems are to be correctly interpreted. For example, best estimates of global mean sea level (GMSL) change from satellite altimetry indicate a sea level rise from 1993-2013 of 3.2 ± 0.4 mm/yr compared to in-situ tide gauge data of 2.8 ± 0.8 mm/yr (Church and White, 2011, 2013). While this would seem to imply recent acceleration in the rate of rise of mean sea level (MSL) from its long-term average of 1.8 ± 0.2 mm/yr, no clear evidence of such acceleration can be detected in the long-term tide gauge records. Could this discrepancy then, in part, be a reference system problem? While the above example highlights issues at the global level, monitoring issues at the local level are just as important to climate change studies. It is the local surveyor who is responsible for providing the high precision measurement link between a tide gauge and the various bench marks needed to monitor its stability. In New Zealand, it is the surveying community (in conjunction with others) that has been at the forefront of the long-term sea level change analyses that have informed public policy makers on future climate change scenarios (e.g., Hannah et al, 2010). In any climate change analysis, “what if” scenarios form an important part of that analysis. In principle, integration and analysis of the relevant data needs to precede mitigation and adaptation. It is the outcome of such analyses that will inform policy makers if the primary need is one of mitigation or adaptation. Not only must the spatial data used be in the same reference system (see 2.1, above), but the spatial analysis tools used for such analyses must be capable of the necessary analyses. Such tools, which are typically part of a GIS, are found in the surveyor’s tool kit (e.g., Mardkheh et al, 2012). From the surveyor’s spatial perspective, climate change mitigation measures need to be developed for three primary land use categories. 2.3.1 Urban Areas/Human Settlements. Here the surveyor’s professional focus will be upon urban design(so as to reduce carbon footprint), land tenure issues (so as to address housing and urban poverty needs), and building orientation (so as to maximise the use of renewable energy sources). In Italy, for example, surveyors use their professional skills to assist in certifying the energy efficiency of both new and renovated buildings. 2.3.2 Peri-urban Areas. These are areas of rapid urbanization that are typically heavily influenced by rural-urban migration. Here there is a need both for spatial planning tools and for fresh approaches to land tenure issues. De facto urbanization by squatting is not a long-term, nor a sustainable solution. FIG, (2010) notes that, “access to land ---- is challenged by a lack of clearly defined property rights which in turn causes disputes and resultant instability”. 2.3.3 Rural Areas. These regions are largely influenced by agriculture, forestry and farming practices. For some populations, fishing and mineral extraction are important activities. As urban areas expand (possibly due to climate change migration) and arable land resources diminish, increasing pressure will be placed upon the remaining productive land resource. The surveyor is not only able to use his spatial tools to assess and analyse the extent and character of climate change impacts, but also to improve land productivity. In the developed world, precision agriculture techniques using real-time GPS measurements have been shown to be able to improve land productivity by more than 30%. In addition to the above, climate change adaptation will involve the design and construction of new infrastructure (particularly in the coastal margins and in flood prone areas), the re-location of land boundaries (particularly those abutting water bodies), re-forestation, the development of carbon markets and the construction of renewable energy sources. All of these activities require the intimate involvement of the surveyor. In 2012 the United Nations Environment Programme issued its report on the most important emerging issues related to the global environment (UNEP, 2012). The top ranked issue in that report relates to aligning governance procedures to the challenges of global sustainability. It involves the task of putting in place environmental administrative and governance processes that are representative, accountable, effective and transparent. This, too, is an underlying theme in FIG (2010). The land and seas form two crucial components of the global environment. In the modern world, the first step to sustainable governance of a resource is to understand the environmental characteristics of that resource and its spatial dimensions. In this regard, it is the surveyor who undertakes the spatial measurements that determine the dimensions and the topography of both the land and the sea floor. It is the surveyor who integrates these data into the Geographic (or Hydrographic) Information System (GIS) that, in turn, allows these areas to be displayed in digital form, thus providing the basic stepping stone for their sustainable management and governance. Recognises and respects legitimate tenure right holders and their rights. Safeguards all holders of these rights against threats and infringements. Promotes and facilitates the use and enjoyment of these rights. “States should provide systems (such as registration, cadastre and licensing systems) to record individual and collective tenure rights in order to improve security of tenure rights“- (Sec. 17.1). At their very essence, these tasks fall squarely within the professional domain of the surveyor. In most jurisdictions it is the surveyor who defines land (and sea) boundaries, who understands the rights associated with the associated land parcels and who helps devise the administrative and governance processes used to control these parcels. The successful land titling project in Thailand that was initiated in 1984 has served as a model for other Asian nations as an example of what the surveying community can achieve (Brits et al, 2002). On a much smaller scale it was two New Zealand surveyors who, in 1957, travelled to Tonga to begin work on designing and implementing the official cadastral survey system – a system that continues to work well to this day. Their task was to help fulfill the constitutional requirement that every Tongan man should be allocated an area of arable land for the support of his family, (Alexander and Wordsworth, 2013). Unfortunately, in some cases, while the surveyor may wish to be a change agent, that which can be achieved is constrained by institutional impediments such as political systems and gender bias. Long-term sustainable solutions depend, in part, upon addressing such issues. The 11th ranked issue in UNEP, (2012) is the need to boost urban sustainability and resilience. The key to such sustainability is seen to lie in the concept of “green” cities or “eco” cities which differ from conventional cities in that they, “have a vital mix of land uses within their borders, produce renewable energy and provide low-energy transportation opportunities”. It is clear that the design of such cities will require multi-skilled teams of whom the urban planner is but one. It is of relevance to note that in some jurisdictions (e.g., New Zealand and NSW, Australia) such planning functions form an important part of the surveyor’s training and tool kit. In these jurisdictions, the design of urban and rural subdivisions, with their associated planning constraints, are an integral part of professional surveying practice. 4. SMALL ISLAND DEVELOPING STATES (SIDS) – WHAT ARE THE ISSUES? SIDS were first recognized as a distinct grouping of countries at the UN Conference on Environment and Development held in June, 1992. They are a distinct grouping of developing countries, typically low lying, that share similar social, economic and environmental vulnerabilities. Their greatest challenge is one of sustainable development at a time when, for some, their very existence may be under threat. a reliance upon the use of the coastal zone for tourism or marine related activities. In many regards it is a combination of small size and this latter reliance that makes them particularly vulnerable to sea level rise and storm related devastation – both potential consequences of climate change. It is thus no surprise that, amongst other things, the 2005 Mauritius Strategy for SIDS (UN, 2005) specifically mentions the need for strategies and actions related to climate change and sea level rise, natural and environmental disasters, and land resources. In order to provide a first measure of vulnerability, Brigugilo (1995) developed a normalized vulnerability index. By his assessment, SIDS countries had a vulnerability factor of 0.635 versus an index of 0.418 for non-island developing countries and an index of 0.328 for developed countries. Even allowing for subsequent refinements in these indices, the message remains clear, that SIDS are far more vulnerable to natural disasters and external shocks than larger, non-island developed nations. Limited physical space within which to adapt. Small populations but with a high density, again limiting adaptation options. Vulnerability to storm events of increasing severity. Relatively small watersheds and threatened water supplies. Narrow (and decreasing) range of land use makes self-sustainability increasingly problematic. Increasing coastal hazard risk compromises tourism (typically an important income earner). In total, the problems arising from climate change that directly affect SIDS are vastly greater in overall magnitude than those facing many of the non-island developing nations. It is in this arena that surveyors give thought to the contribution that they can make. 5. PULLING IT TOGETHER - WHERE CAN SURVEYORS ASSIST? The previous paragraphs provide a foundation for understanding the role of surveyors and the particular problems faced by SIDS. From them it should be clear that surveyors have an important role to play in helping SIDS, not only in their development (as has been the case in the past), but also in their adaptation to future change and the mitigation of the effects of such change. The following avenues for action are suggested. 1. The provision, support and maintenance of local, stable coordinate systems that not only support local mapping but that will also allow change to be monitored. The South Pacific Sea Level and Climate Monitoring Project, sponsored by the Australian Agency for International Development, is a good example of what can be achieved. The stations that are part of this network are shown in Figure 1. While some additional work needs to be undertaken to ensure the long-term stability of the local coordinate systems used, work is now underway on the essential task of linking each of these sites into a global reference framework. These links need to be maintained into the future, driven in part, by the fact that many of these stations lie in tectonically active areas. The determination of any tectonic uplift or subsidence is an essential element in understanding long-term sea level rise risk. Recent studies in New Zealand, for example, have shown that the Wellington region is subsiding at approximately 1.7 mm/yr, thus essentially doubling the relative rate of sea level rise for that region from 2.0 mm/yr to 3.7 mm/yr (Bell and Hannah, 2012). 2. The integration of local land and resource related data into a Land or Geographic Information System, thus facilitating risk, disaster management and economic analysis. The cadastre will form a fundamental layer in any such system. Given that SIDS by definition are small, such systems need not be expensive. Low cost GIS packages exist, as does open source software. Unmanned aircraft systems (UASs) can now be used for aerial data collection, both for remote sensing imagery and mapping imagery. Although typically used for tasks that require fast data collection and frequent observation of a specific area, the extent of their coverage is a simple function of flying height and lens focal length. UASs offer excellent potential to SIDS where the cost of mobilizing traditional aerial mapping platforms is very high. 3. The rethinking of some traditional land-tenure practices. In the South Pacific, some 83-97% of land remains vested in the stewardship of indigenous guardians who retain the superior interest in and control of the land (FIG, 2010). Where freehold title to land has been granted in the past, or where such superior interests exist, it may be time to move to more of a leasehold model. Freehold implies permanency, whereas leasehold implies the opposite. Preparing for future inundation, particularly in the coastal margins, may be better served if land-holders had a more temporary (or time-limited) view of their holdings or land tenure rights. Equally, the compression of more people into increasing limited land areas suggests that traditional land tenure rights over the “safer” areas (most likely the higher standing land), will need to be reconsidered. 4. Where appropriate, improved transparent systems of land governance (e.g., registration, cadastre and licensing systems) need to be implemented to record individual and collective tenure rights. Such transparency will not only help eliminate corruption, should it exist, but as noted in Point 2. above, such systems form an essential and necessary pre-requisite to effective land administration and management. 5. Improved land planning practices. It is clear that land in the coastal margins will require either measures to mitigate future sea level rise or will need to be subject to a process of managed retreat. In either event, integrated coastal zone management will be required. Such planning practices are becoming established in some parts of New Zealand (Bell and Hannah, 2012). “What if” scenarios are easily modeled by GIS software. In addition, however, remaining arable lands will need to become more productive if island communities are to at least maintain the status quo. While precision agriculture finds its best use over large expanses of arable land, there will be opportunities for its use in some island communities. 6. New (or extended) research initiatives. The susceptibility of Pacific SIDS to seismic activity and to vertical tectonic motion is well known. However, the spatial extent of such motion needs to be determined. This will require long-term GPS monitoring campaigns such as is found in New Zealand’s GEONET (see www.geonet.org.nz). In addition, work is required on assessing alternative land tenure options and planning practices. It would be preferable that that such activities be undertaken by local SIDS communities wherever possible, but this, in turn, presupposes the availability of a pool of skilled professional people. In some cases this will require an investment in people. Surveyors have traditionally played an unheralded but leading role in the development of small nations. Their spatial measurement, planning, and land administration skills have combined to support the development of essential elements of island infrastructure. As SIDS face the significant changes that lie ahead, the surveying profession has the skill base to provide assistance through this next phase of their development. In recent years it has perhaps been the profession’s lack of public profile that has limited the call for such contributions. This need not be the case in the future. The author would advocate strongly that great benefit could be derived by SIDS if they had greater access to the knowledge and skills that are an integral part of the surveyor’s professional tool-kit. This should be an integral part of their capacity building exercises. Alexander, B., and Wordsworth, L.S (2013). 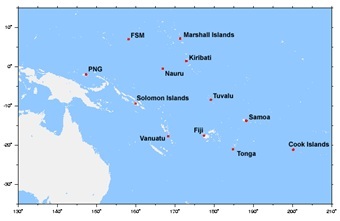 100 Fathoms Square - the Surveying of Tonga. Available from Bruce Alexander, 111 Hackthorne Road, Cashmere, Christchurch, 8022, NewZealand. Bell, R.G., and Hannah, J., (2012). Sea-Level Variability and Trends: Wellington Region. Report prepared by the National Institute of Water and Atmospheric Research (NIWA). Briguglio, L (1995). Small Island Developing States and Their Economic Vulnerabilities”. World Development, Vol. 23, No. 9, pp.1615-1632. FAO, (2012). Voluntary Guidelines on the Responsible Governance of Tenure of Land, Fisheries and Forests in the Context of National Food Security, available from FAO, Rome. FIG, (2004). Found at www.fig.net/general/definition.htm and accessed on 4 Sept. 2013. Hannah, J., Bell, R., Paulik, R., (2010). Sea-Level Change in the Auckland Region. Report prepared for the Auckland Regional Council. Datum – 1986. Survey Review, Vol. 30, No. 1. IPCC, (2007). Climate Change 2007: Impacts, Adaptation and Vulnerability. Cambridge University Press. UN, (2005). Found at http://www.sidsnet.org. UNEP, (2012). 21 Issues for the 21st Century: Result of the UNEP Foresight Process on Emerging Environmental Issues. United Nations Environment Programme, Nairobi, Kenya. Wong, P.P. (2010). Small Island Developing States. WIREs Climate Change 2011 2 1-6 DOI:10.1002/wcc.84. John Wiley and Sons Ltd.
John Hannah completed his BSc (Surveying) in 1970, a Post Graduate Diploma of Science in 1971, and became a Registered Surveyor in New Zealand in 1974. He subsequently completed an MSc and PhD at The Ohio State University. From 1982 -1988 he was employed by the Dept. of Lands & Survey, New Zealand as a Geodetic Scientist and then as Chief Geodesist/Chief Research Officer. After an appointment to the Chair in Mapping, Charting and Geodesy at the US Naval Postgraduate School, California in 1989-1990, he returned to New Zealand as Director of Geodesy and then Director of Photogrammetry for the Dept. of Survey and Land Information. In 1993 he joined the School of Surveying at the University of Otago as Professor and Head of Department. He became the School’s Dean in 2001, relinquishing this role at the end of 2004. From 2005-2007 he was President of the NZ Institute of Surveyors. He retired from the University of Otago in 2012 and is currently the Managing Director of his own consultancy, Vision NZ Ltd. He is Chair of the FIG Task Force on Climate Change and is on the Council of Standards New Zealand. University of Otago Vision NZ Ltd.